The Great Pacific Garbage Patch is one of the biggest indicators of the nasty toll humans are having on the natural world, weighing in at more than 3.5 million tons of trash. The vast soup of plastic bits is getting bigger and bigger every year, breaking down into dangerous particles that are often consumed by sea life. Several efforts have been designed to try to downsize it, or at least stop its growth, but there has yet to be much, if any, significant success. 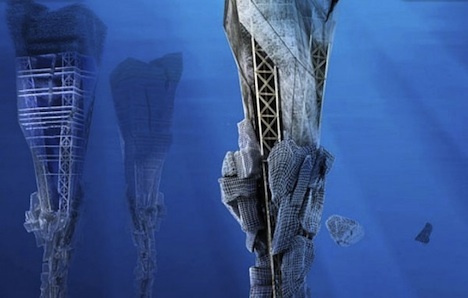 Despite the fact that at present there’s really no way to get rid of it and keep another one from forming (apart from drastically cutting down on the use of plastic), a group of Serbian architects have created some underwater skyscrapers. The concept is called the Lady Landfill Skyscraper, and it’s proposed that a number of them could be placed near in garbage patch zone to collect trash and turn it into energy. The building looks a bit like a moss-covered iceberg from the ocean surface, with long stems that stretch deep into the sea to remove and recycle floating pieces of trash. The structures come with four communication cores that connect three main levels; garbage collectors on the bottom, a recycling plant in the middle, and housing and recreational levels on top. The waste heats up in the recycling chamber and is converted into a gas that is stored in giant battery-like structures. The design was an Honorable Mention at the 2011 eVolo Skyscraper Competition, showing some pretty serious promise that bringing energy to the mainland from these structures may be possible with a little more tweaking and research. It would be good to see something even mildly positive come out of the environmentally disastrous ocean garbage patch. Do you think something like this has real potential, or do you think it’s more for show than anything?